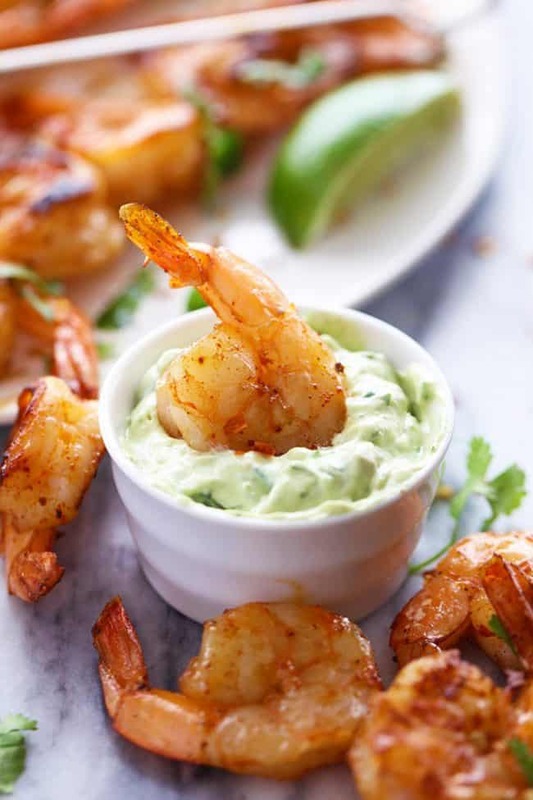 Grilled Spicy Lime Shrimp with Creamy Avocado Cilantro Sauce has a simple but full of flavor and spice marinade. The creamy avocado cilantro sauce is the perfect cool and creamy dipping sauce. Do you ever get through a week and are just so happy that you survived? That was last week for me. I barely made it. It was the last week of school plus we are in the moving process. On top of it all my little girl turned two! We were able to pull it all together and managed to have an amazing Finding Nemo Birthday Party. If you follow me on instagram you will see her amazing cake! My little girl is obsessed with “Meno” and loved every minute of it. We may have given her her presents to her in Amazon boxes but we totally pulled it together! It was a huge success. We are loving the warmer weather here and since we have been so busy lately we are loving to grill. My husband LOVES shrimp and asks me to cook it all of the time. I decided to make an easy marinade for these shrimp that really packed a punch. It had such a delicious blend of spices and the result was amazing. 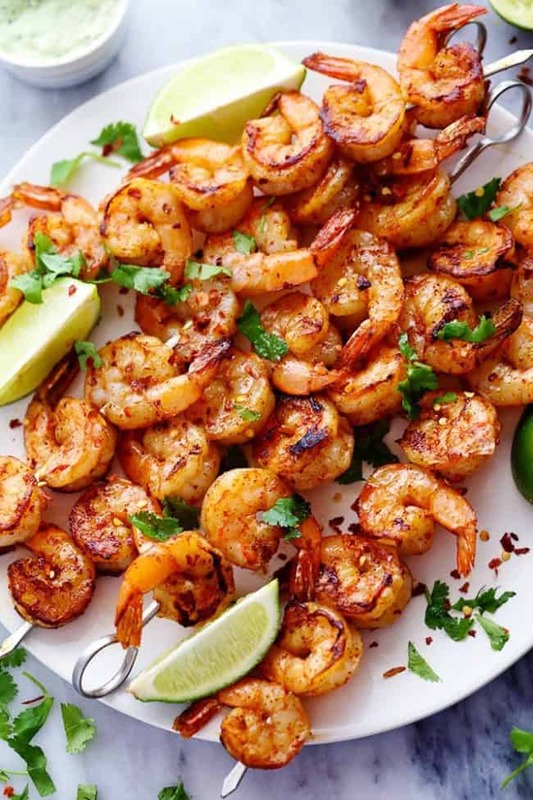 The great thing about shrimp is that they are so easy to cook! They grill up in just a matter of minutes. 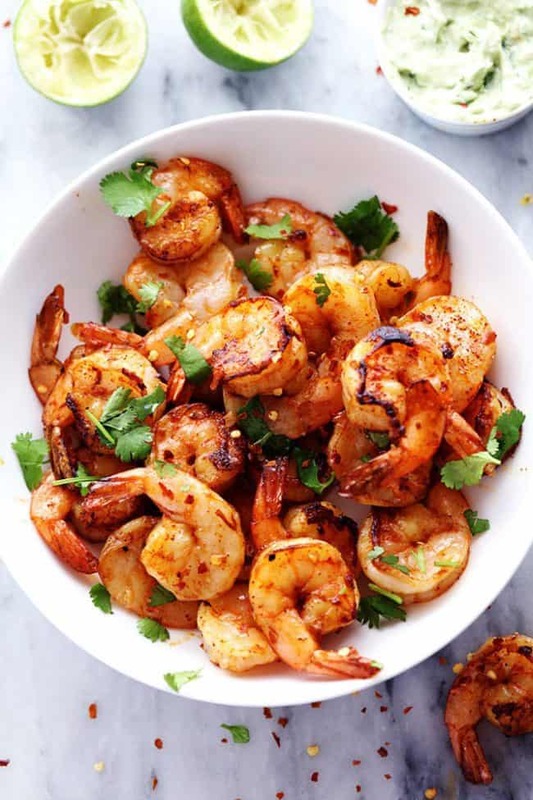 The marinade on these shrimp is out of this world! It has such a great blend of spices and flavor. My favorite part was the Creamy Avocado Cilantro Sauce. It was so cool and creamy on these spicy lime shrimp. We are a family of dippers so most everything involves a dip. And this dip was the perfect compliment to help cool down the spice in the shrimp. You guys are going to LOVE this recipe. It is such a quick and easy recipe that is absolutely delicious, especially if you love shrimp! This should go on your list of things to grill. You are going to love it! In a small bowl whisk together lime juice, olive oil, garlic, chili powder, cumin, paprika, salt, pepper, red pepper flakes. Pour into a resealable bag and add shrimp. Toss to coat and marinate for 30 minutes. Preheat the grill to medium heat. 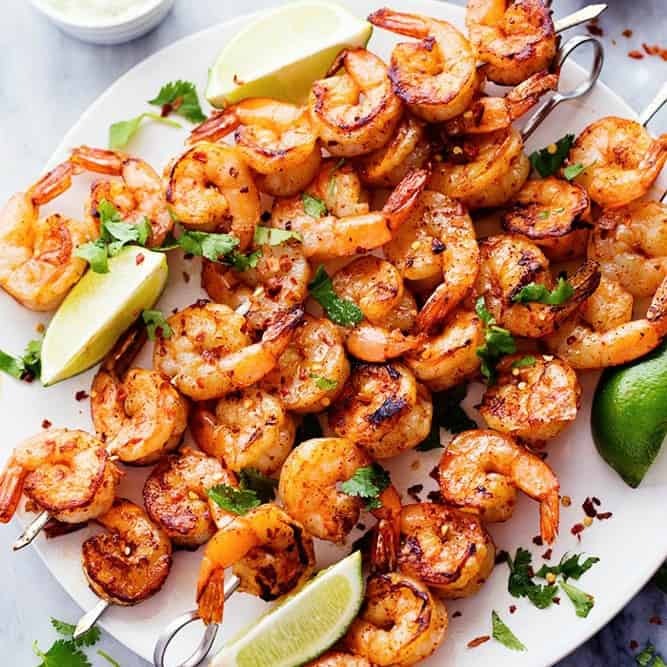 Put the shrimp on skewers and place on the grill. Grill on each side for about two minutes or until no longer pink. To make the creamy avocado cilantro sauce add the avocado, greek yogurt, garlic, lime and cilantro. Pulse in a food processor until smooth. Add salt and pepper to taste. Serve immediately with shrimp. Good lord this looks good! Is the result hot, medium, mild of just flavorful ?????? 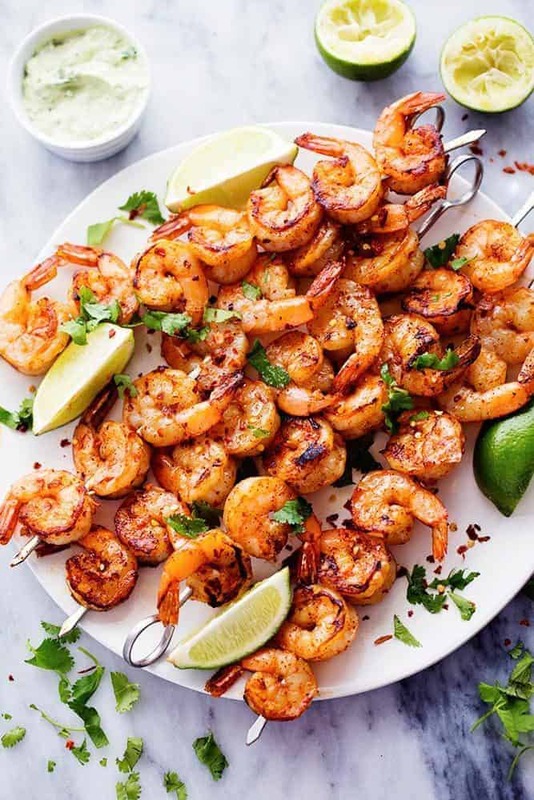 What size shrimp do you buy for this recipe ??? I agree with Jim’s question….what size shrimp. I am seeing 7 to a skewer, so maybe the fish market could direct you to a correct size. I am thinking it is spicy (the marinade) and the dipping sauce tones it done as needed. Great recipes, can’t wait to try. This was easy and FANTASTIC. Great flavor- not overwheming! The marinade is great on its own, but when you add the sauce it takes it to a new level. i love that sauce! gonna have to get shrimp out and make ASAP! Is the nutritiona information listed anywhere? Have you ever tried adding some tequila to the marinade……..? This recipe sounds delicious! I bet these shrimp would be great in a shrimp taco with the dip spread on the tortilla. Yum…yum! Looks amazing! I’m so making this. What side dish would you serve with this? This was absolutely delicious and so simple!! I served it with grilled asparagus and homemade mac & cheese. It was a hit! Made this recipe tonight. I used 2 lbs of 21-25 shrimp and doubled the measurements in the recipe while omitting the pepper flakes (other people eating them don’t like spicy food). I wonder if doubling the cumin was too much as well as the yogurt. The shrimp had a very strong cumin flavor, more than anything else. The yogurt gave a sour taste to the dipping sauce. I added some honey, the juice of a orange and another avocado to balance out the sauce more. I used 4 18 inch wooden skewers (soaked in water for 2 hours) and was able to get all 60ish shrimp on them. I only skewered thru the thick end of the shrimp and was able to get alot more shrimp on it this way. Even tho they were packed in more closely, they cooked perfectly in the 2+2 cooking time listed. Even tho the shrimp had a strong cumin flavor, it paired very well with the dipping sauce. I also grilled some canned potatoes (marinated in Italian dressing and Mrs. Dash), whole mushrooms and zucchini slices (with garlic powder, black pepper and smoked paprika) to go along with the shrimp. I didn’t taste any garlic in the shrimp or the sauce and noticed a lot of the garlic remained in the bag after skewering the shrimp. I think these shrimp would go well with a seasoned rice instead of potatoes or garlic bread. As another person mentioned, I also thought while eating these that they would go good in a fluffy pita bread with the sauce and some shredded lettuce and tomatoes. These shrimp could be chilled and would go great on a salad. The shrimp and sauce were a huge hit. It will be used again, thanks for the yummy recipe! We love this recipe. I’ve added a heaping 1/4 teaspoon of chipotle pepper for a little extra kick. 😀 YUM!! That sounds delicious! So glad you loved it! Thanks for your comment :)! I made this recipe and it is awesome, amazing flavor like when you go out to eat. I marinade then grilled on skewers….solid dish for whole 30 without the avacado sauce. really good. That is great to hear!! Thanks for sharing! This was BOMB.COM! My family really enjoyed this. I have picky eaters too. I cannot wait to try this recipe, but with a ,trio bell peppers, tomatoes,and avacado,all wrapped up in tortilla shell & a few more spices like turmeric powder besides garlic for inflammation bc of health issues other than that I think not too spicy and we’re on to something, Mrs. Alyssa thks sweetie ? Made this tonight and it is just plain delicious. Going to make the Calif Salad for a Baby Shower & may also make the Tuscan Pasta too. Both look Delicious. This recipe is FABULOUS!!! Spicy shrimp with a delicious dip. Quick and easy!!! This dish was amazing and very flavorful! I will definitely be making this again. This was incredible! My boyfriend and I made it for the first time tonight and we both were so impressed. This will definitely be a summer favorite for us! We tossed a bell pepper in the sauce too and grilled it. Delicious! In place of the lime juice, garlic, cumin, salt and pepper you can substitute a quarter cup or so of Old Havana Foods Mojo marinade. It’s a great timesaver and we love it on pork, chicken, shrimp, skirt steak, salmon etc. This is soooo good. Used 3Tb of lime juice in both the marinade and sauce, and tons more garlic. We are not big grill fans so I cooked the shrimp in my Cuisinart Griddler. 2 minutes on medium high, nice char, all done. Thinking about other uses for the sauce. Can the dipping sauce be made ahead of time? 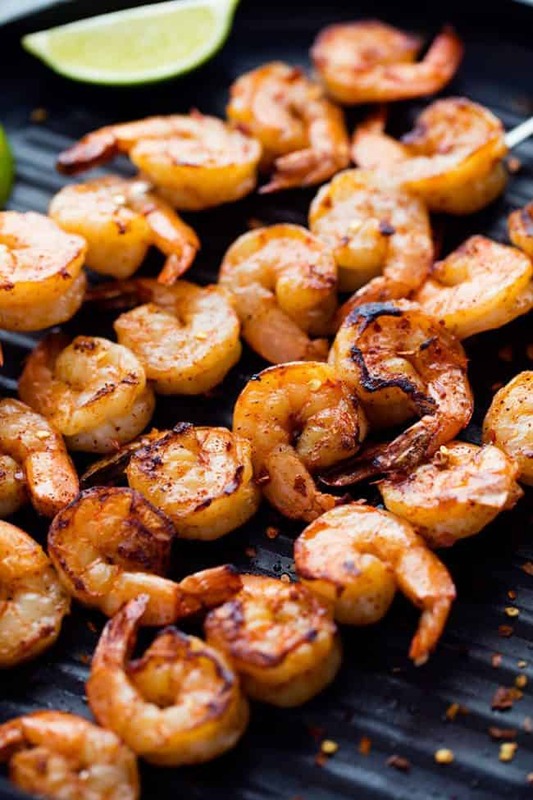 We’re going camping at the beach and want to make these shrimp on the charcoal grill! Hi there! Just wondering if you or anyone on here has tried this with chicken wings? We’re doing keto, and my husband is looking for some good spicy wing recipes. Thanks! Omg the sauce was sooooo good my husband and I have been having guacamole and we’re bored of it…this is definitely a very tasty alternative…sooo good. Also the shrimp marinade was amazing smelled and tasted delicious. How many carbs in this recipe per serving? I like to use skinnytaste.com or myfitnesspal.com for any nutritional information. Is there any nutritional information on this recipe? Where is the nutritional information for these recipes? Lose the cumin. Otherwise, a simple, quick marinade.